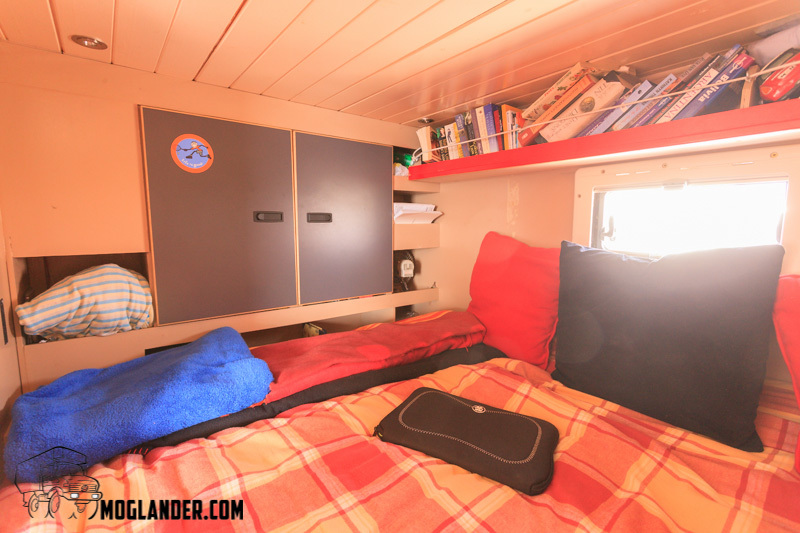 there are loads of photos of the outside of the truck in the various blog posts, but very few of what’s inside. 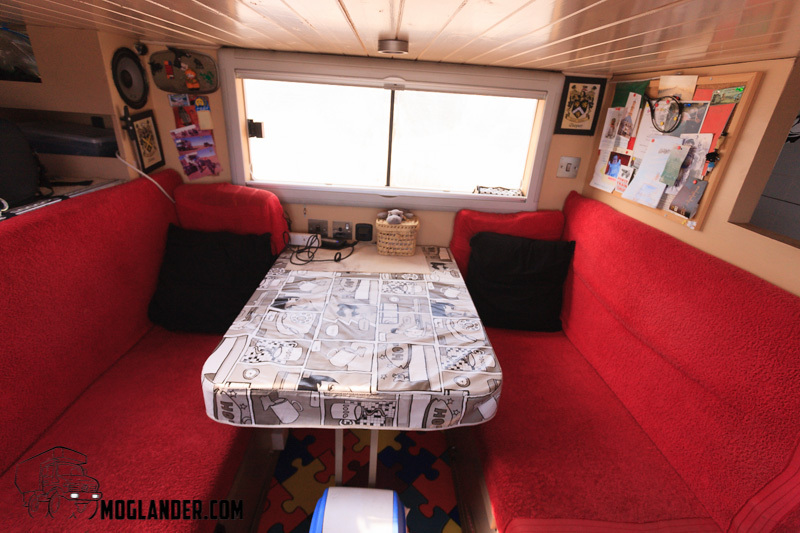 Hope you like a look inside Moglander. 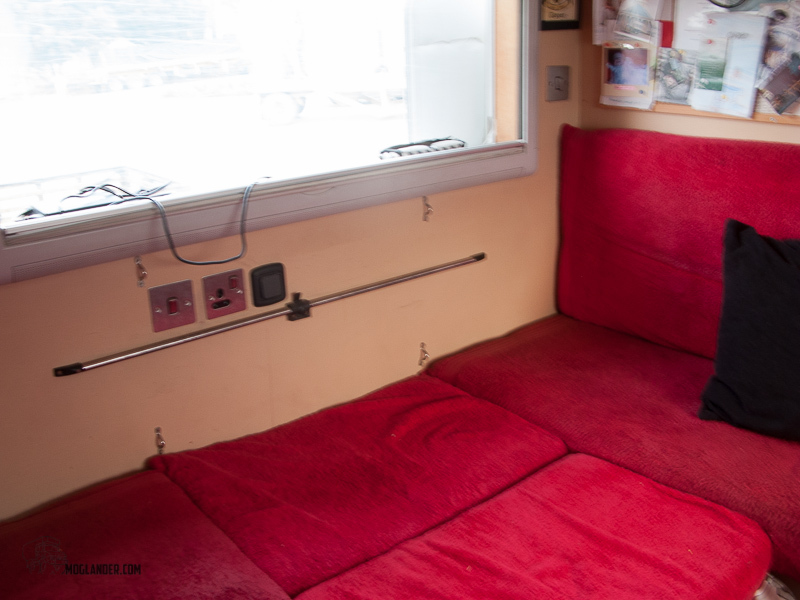 looking directly at the back of the truck, here is a bed and a small window for night time ventilation. 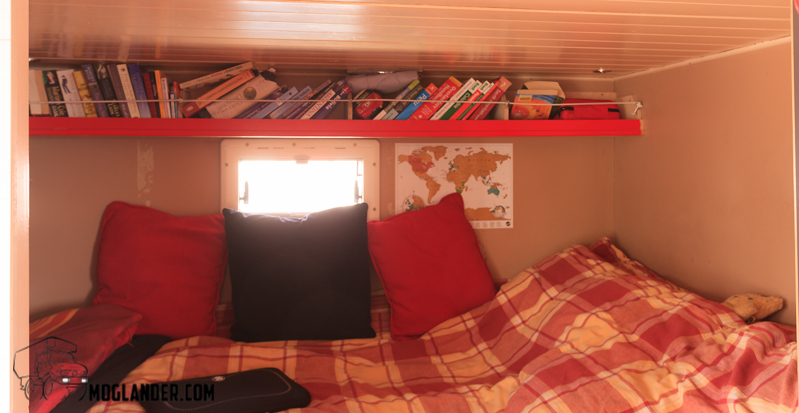 The bed is a normal sized double bed, with a regular mattress and duvet. We really like that we do not have to make up a bed each night. Looking at the foot of the bed, there is some storage presses. 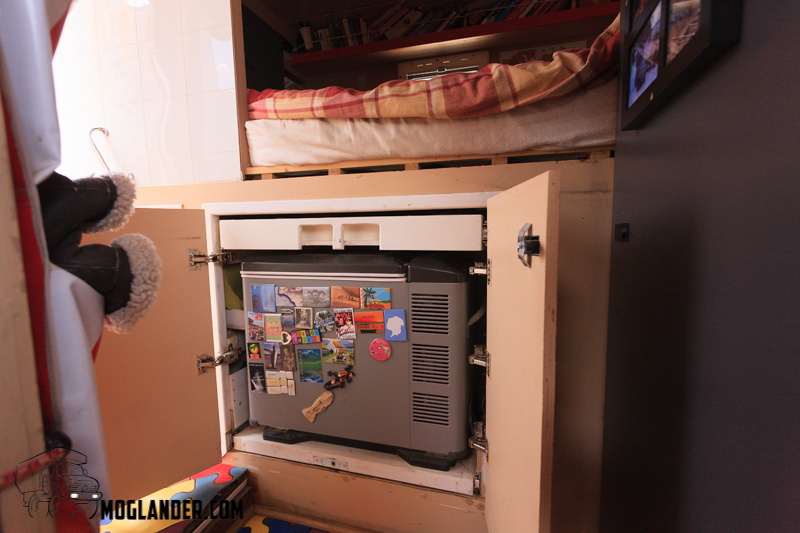 There are also electric fans in the cubby holes on the left and right for when it gets way too hot. The wardrobe is beside the bed. Freezer in the press. 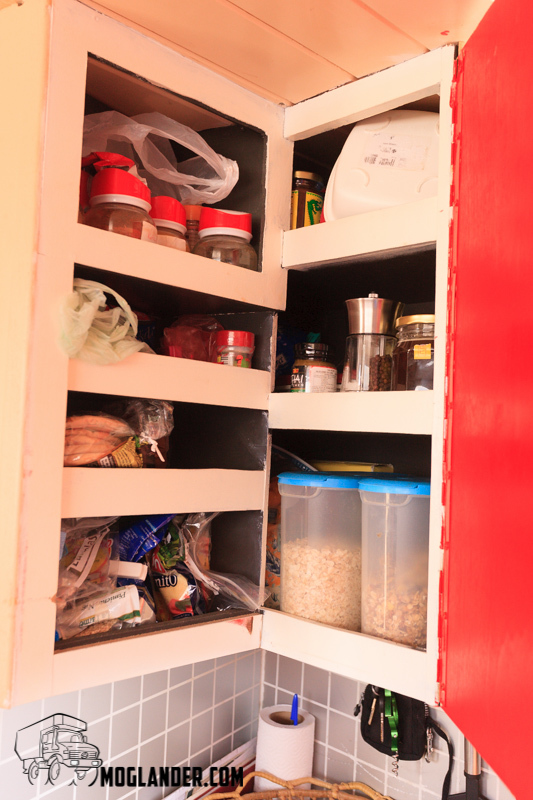 There is a drawer over the freezer. 40L ENGEL freezer slid out from its press. 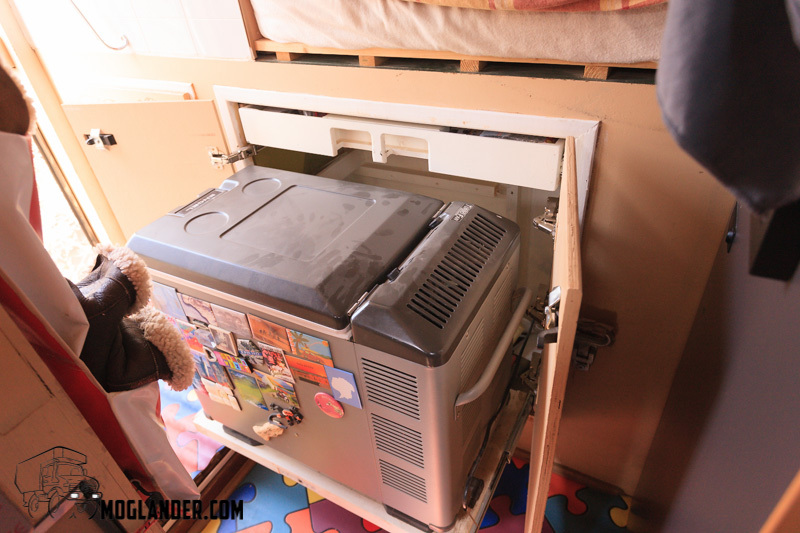 The freezer (which can also act as a fridge) sits on a quick release plate, so can be easily dismounted and brought anywhere else you like. 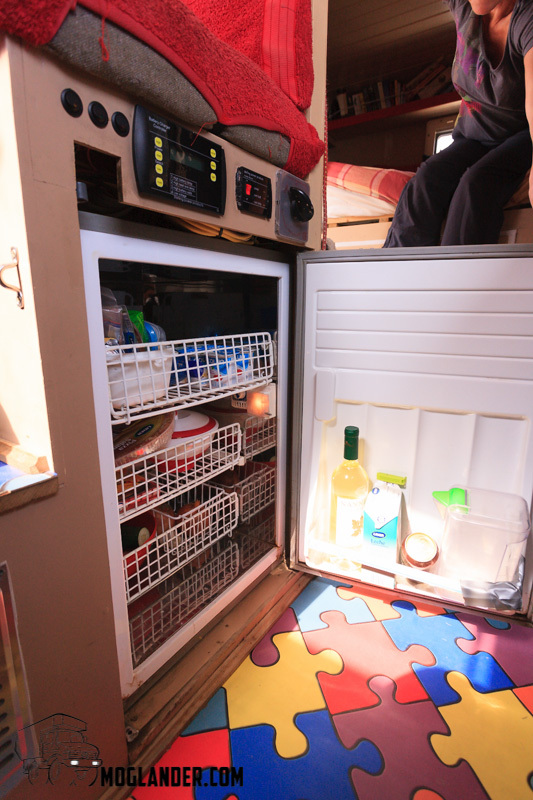 The freezer can be plugged into the mains, or while in the truck, it operates on 12V. 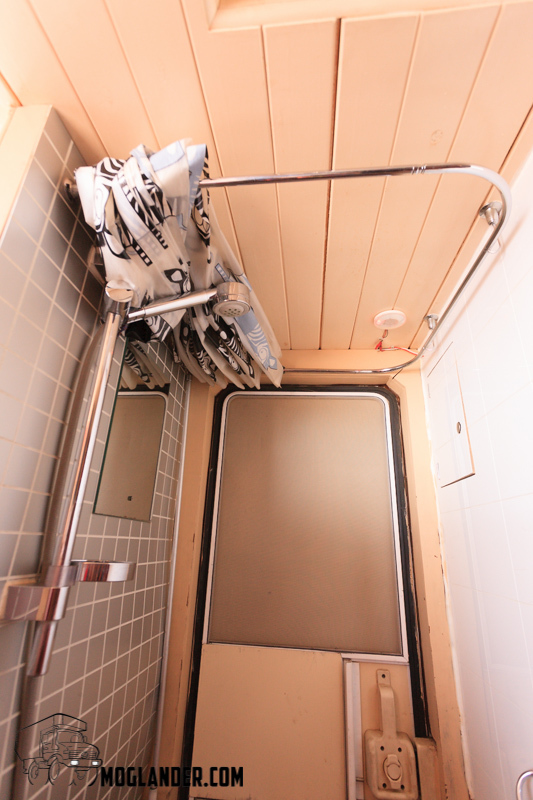 Where you see the towels hanging, this is a door into the front cabin. It opens right behind the driver’s seat. 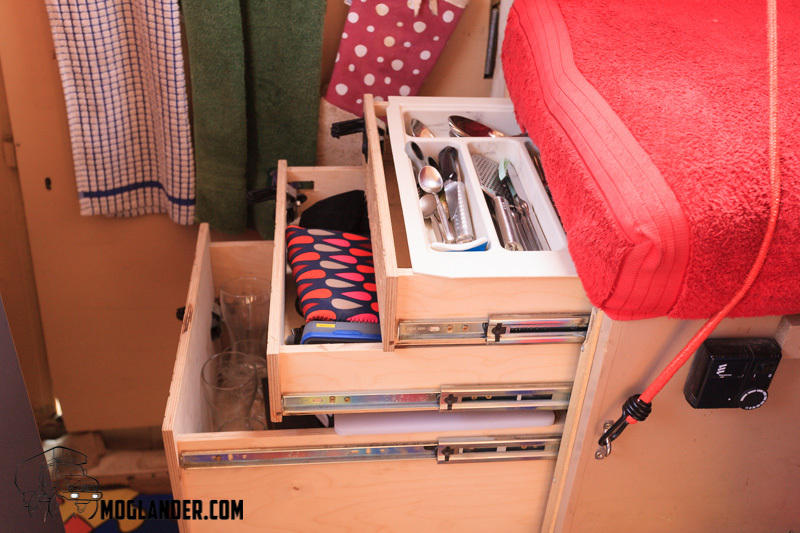 3 drawers hold a lot of stuff under the seat. Each one has a full extension slide, and locks closed for traveling. 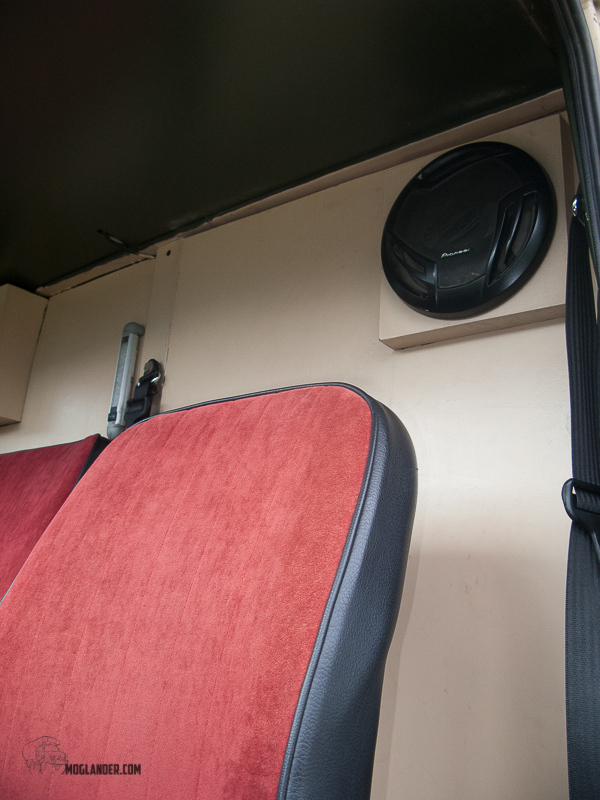 on the photo above, the bungy cord is used to hold the seats in place while traveling. These are probably not needed for normal roads, but we like to get out into the wilder country. 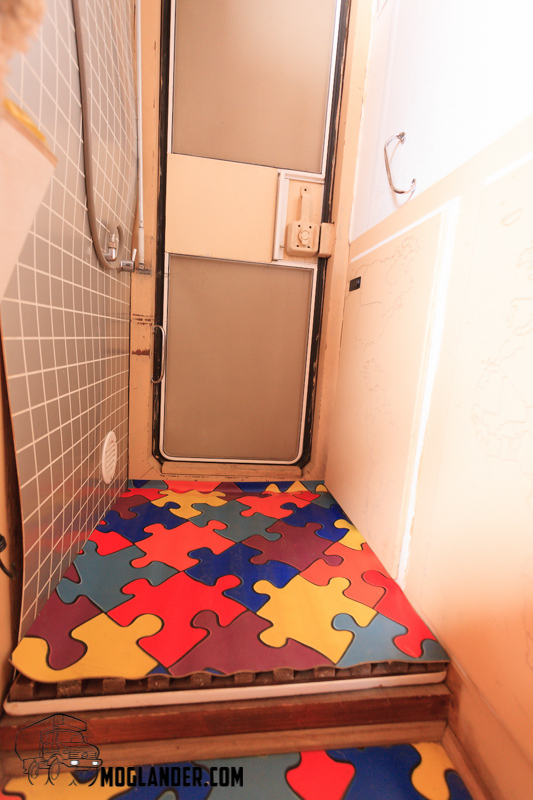 right hand presses, the door opens down flat and can be used as extra workspace. A = the solar panel controller. This delivers up to 14 amps on a very sunny day. B = Volt, Amp and Amp hour monitor. C = water level monitor, showing % full in the fresh water tank. D = Temperature reading, in Celcius both inside and outside. The fruit basket travels nicely just there, with some non-slip cloth underneath. 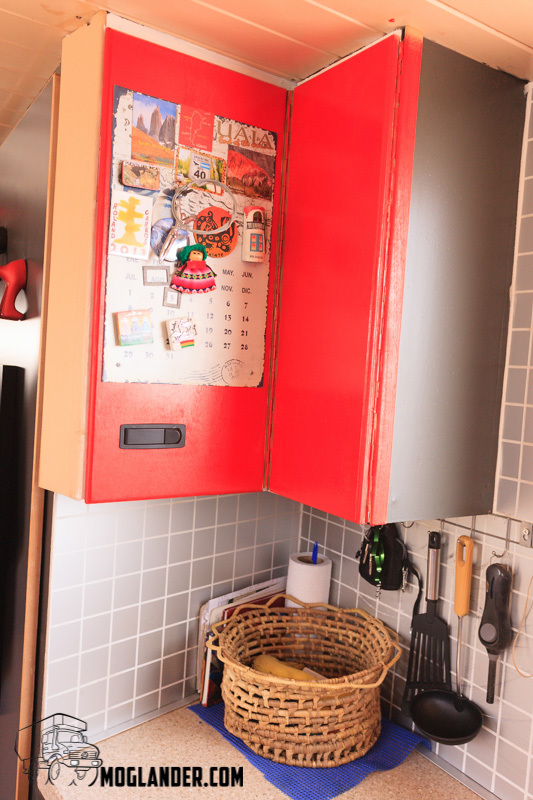 a timber cover for the cooker gives extra worktop space when needed. The window is huge, and has both a fly screen and a curtain. Cooker and sink from above. 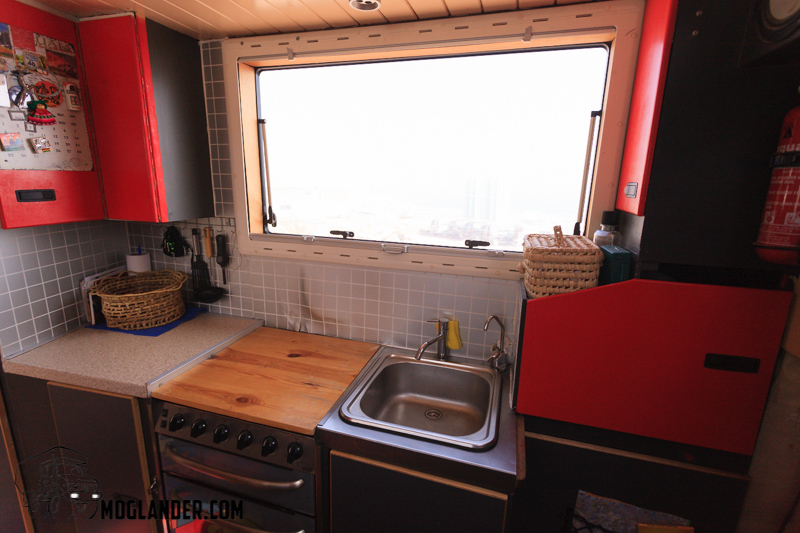 If you want to see what can be done with this little kitchen, take a look at our post about Moglander cooking. 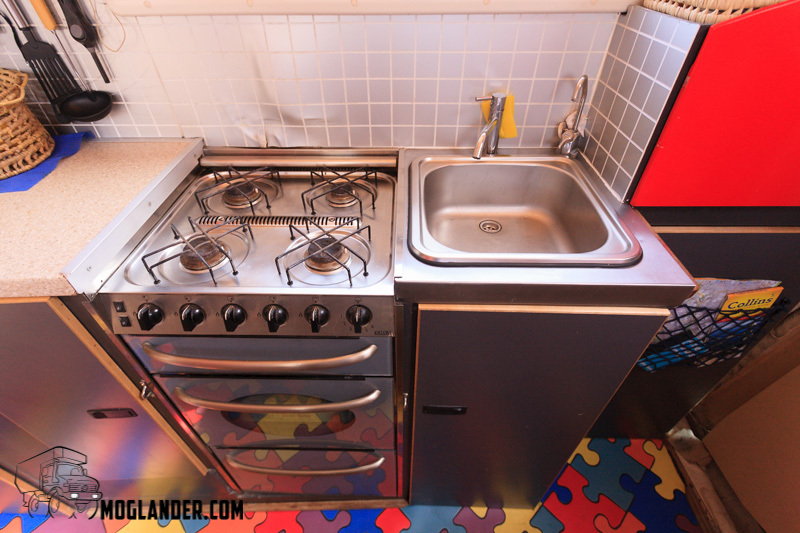 The cooker has a grill and oven. 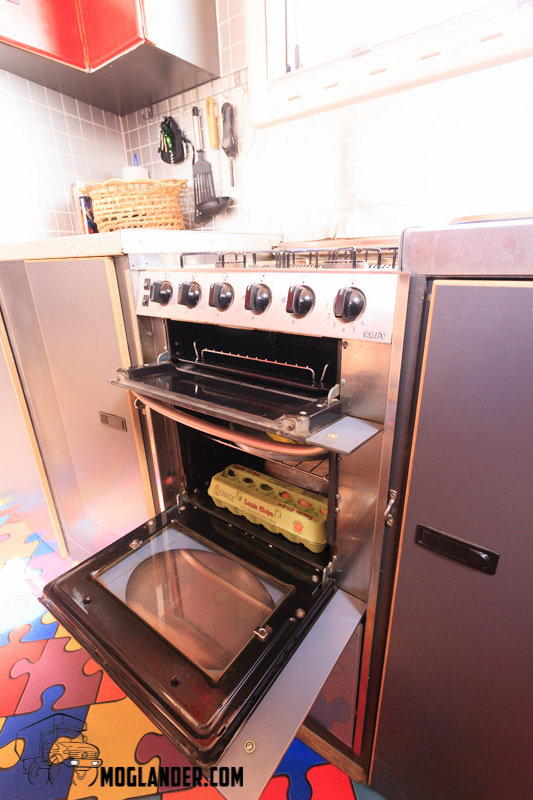 The oven is used to store some stuff, usually bread and eggs. 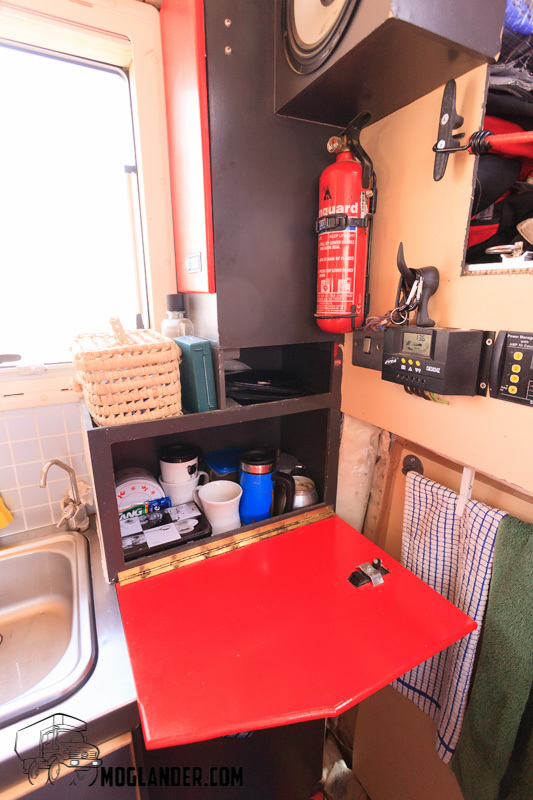 Under the oven is another storage spot, we keep about 6 large bottles of sparkling water in there. 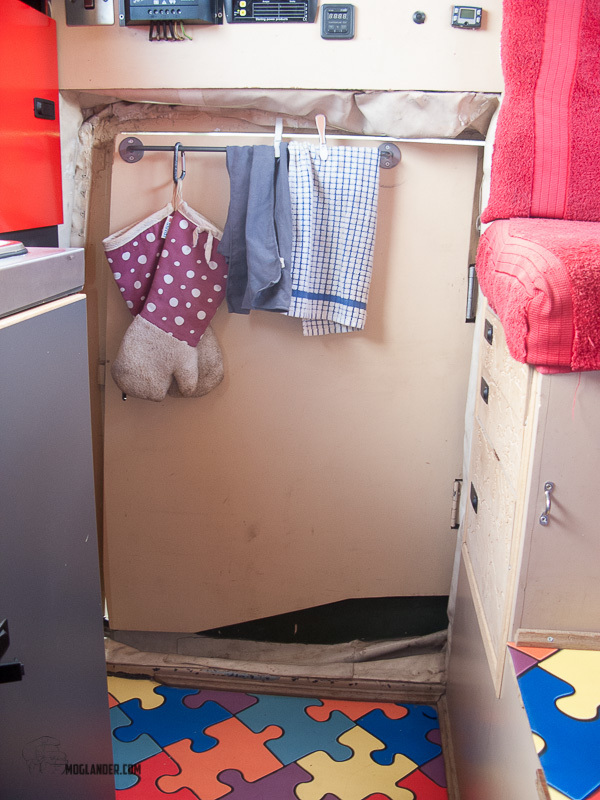 The 60L electric compressor fridge is under one of the seats. The toilet slides out when you need it. It’s a good idea to lock the door so you do not fall out. Shower tray exposed. 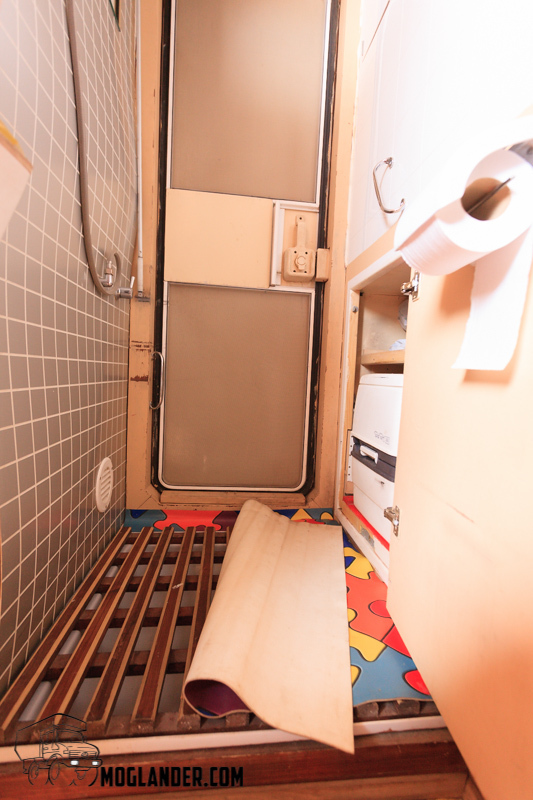 There is a regular shower tray under the timber grid. The toilet is in the press on the right. The seating area and table. This seats 4 easily. We’ve had a few great evenings with friends here. 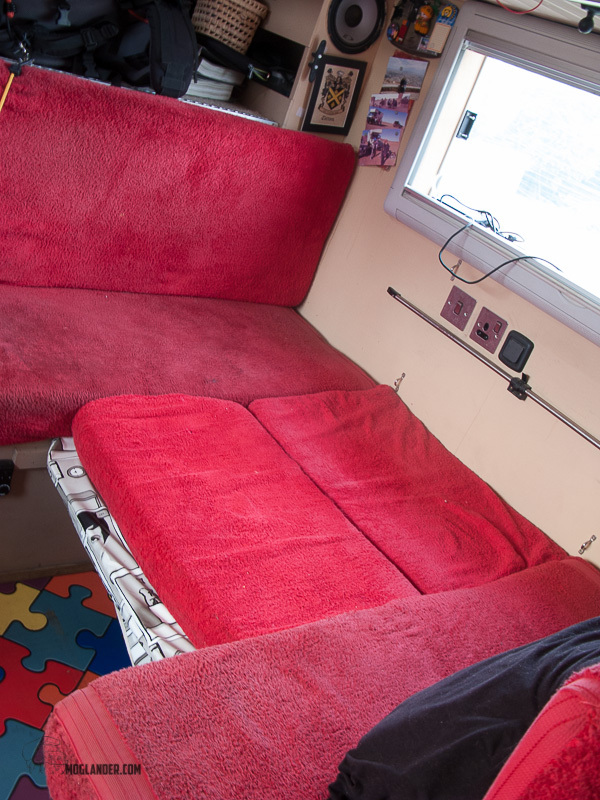 The red of the seat covers is actually red towels, sown up by Merv’s mum – Ruthie. These work great, and are easy to wash. Under each seat, there is extra storage. 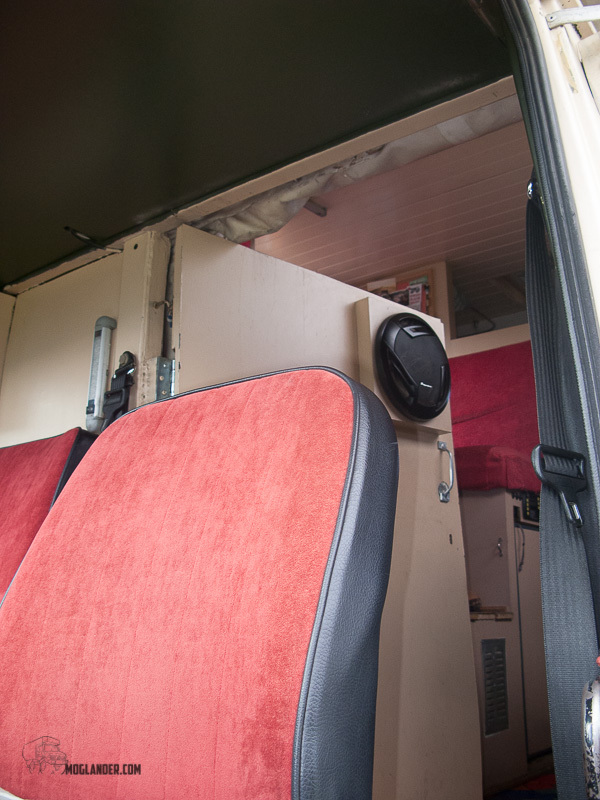 There is loads more storage over the cab of the truck, in the Luton part. 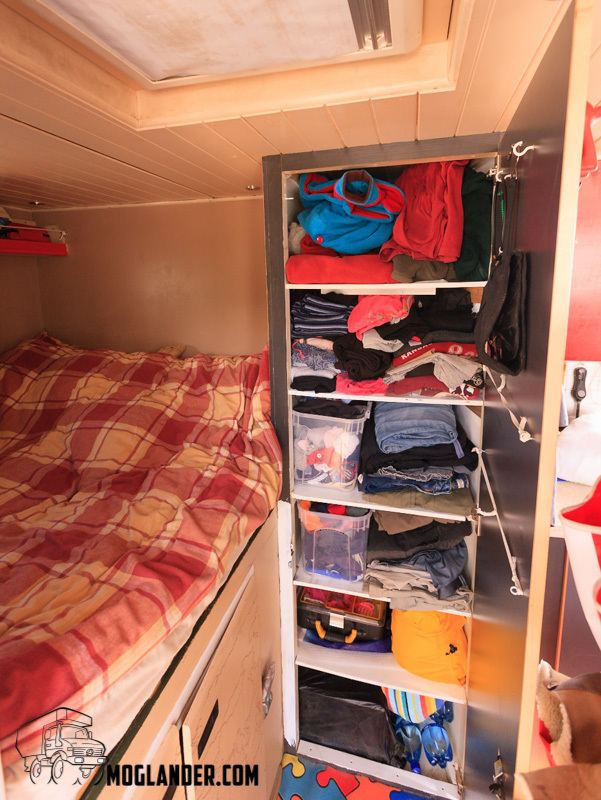 up here we store our backpacks, tent, sleeping bags, Pelican camera cases, winter clothes boxes, spare food box etc. We have a pass through, which we use a lot in practice. If we stop for just 1 night, or the rain is really coming down, or we are on a street in a town, we use it. 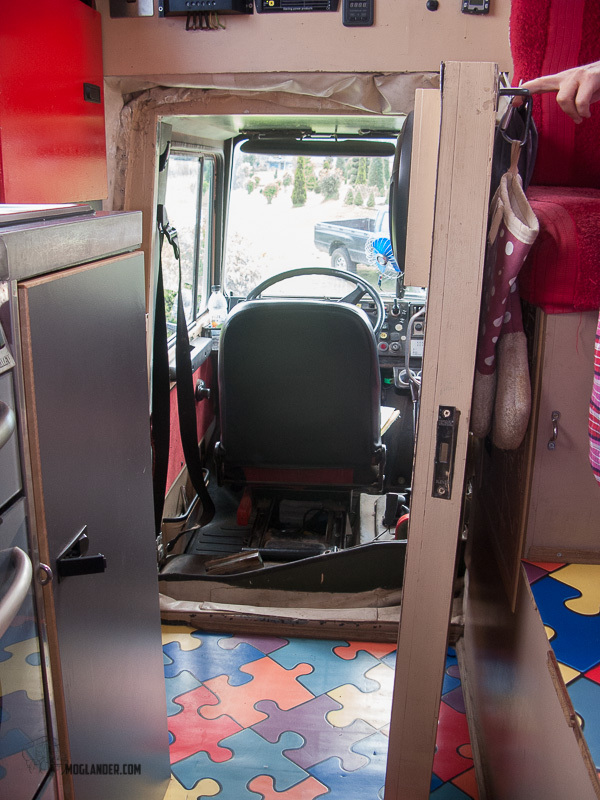 A large panel in the back of the drivers cabin was cut out, insulated, and hinged to become a door that opens back into the camper. View of the door from the camper side. 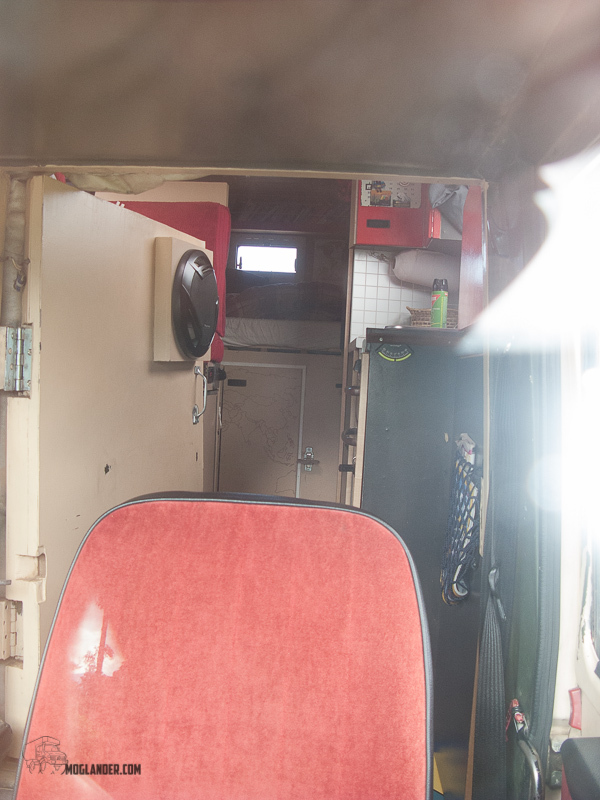 View of the door from the drivers cab side. Door closed. When closed it is quite invisible, i.e. it’s not obviously a pass through. The door can be locked, however the lock is not very strong. 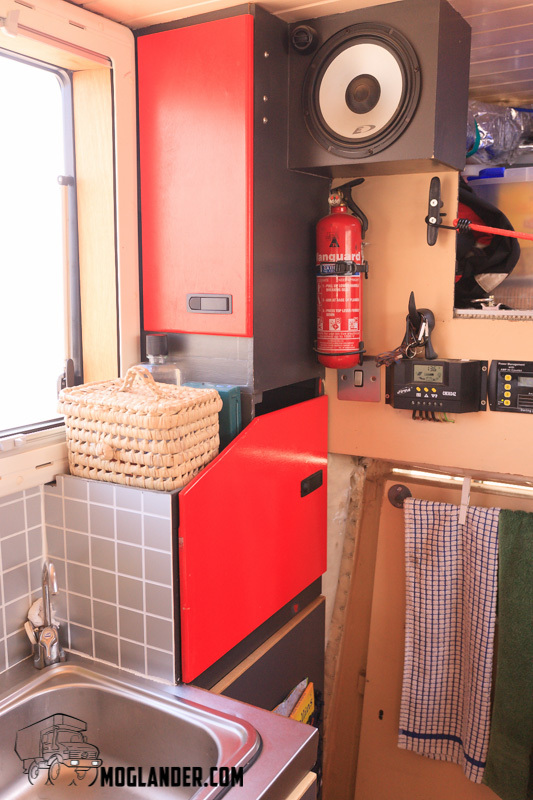 What is very strong is to open the press door in the camper which is quite strong and secure. 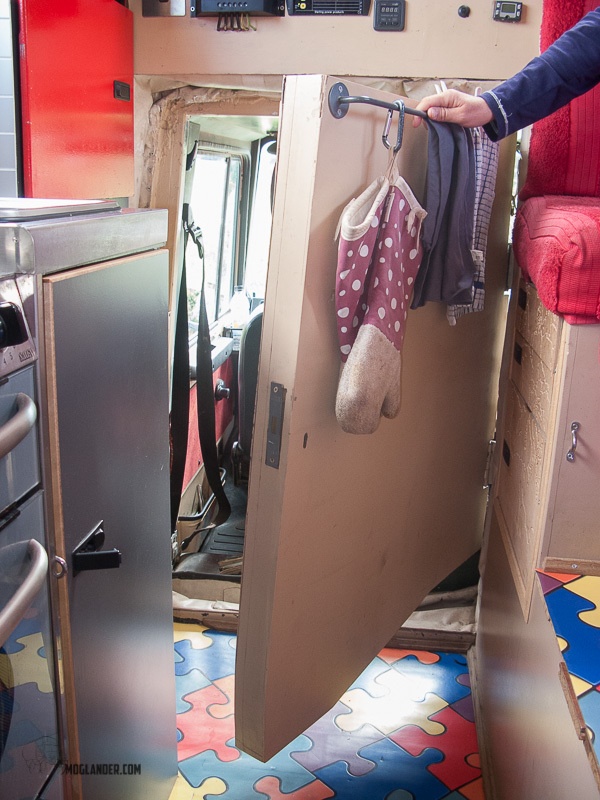 On purpose, we have no visible lock from the drivers cabin, on the basis that from the outside there is no visible way to get into the camper. It’s worked well for both us, and the previous owner. We recently had a house guest who traveled with us for a couple of days (Owen, and Australian guy) Anyway, it meant we set up the bed where the table goes. Luckily I remembered to take a photo! Second bed, seen from the back of the truck. You can see the table just under it.